Every year I tell people I don’t like making a fuss over my birthday. But then as my birthday draws nearer, I start to get a little more excited and I start telling everyone within earshot that my birthday is coming up. Since my birthday is on the last day of the month, it always feels like such a long wait from when September comes to when it is actually “the big day”. For the past couple of years, my birthday has been a bittersweet time of year. I spent my birthday in 2010 flying halfway across the world to be by my grandmother’s bedside as she laid in a hospital bed, and since she passed away four weeks later, my birthday has been a constant reminder of those last days I got to spend with her. But that emotional period also serves as a reminder of how blessed I am and how far my friends are prepared to go to make me happy. (You can catch up on my birthday posts for 2010 and 2011). September 2012 got off to a wonderful start. First, I got a new contract, thus keeping alive my much-coveted dream of a trip back to the US (which I last visited in 1998). Then came the presents. The first completely knocked me off my feet with amazement because of the sheer unexpectedness of it. I openly admit I have a massive crush on the writers of TV show White Collar. Everyone who follows me on Twitter or is a Facebook friend regularly see me post undeniably over-the-top comments about how in awe I am of them. So, imagine my surprise when I got a notice in my letterbox to pick up a parcel from the post office, which contained an autographed copy of the script from one of my favourite episodes of the show (it was the season 2 mid-season finale “Point Blank”)! 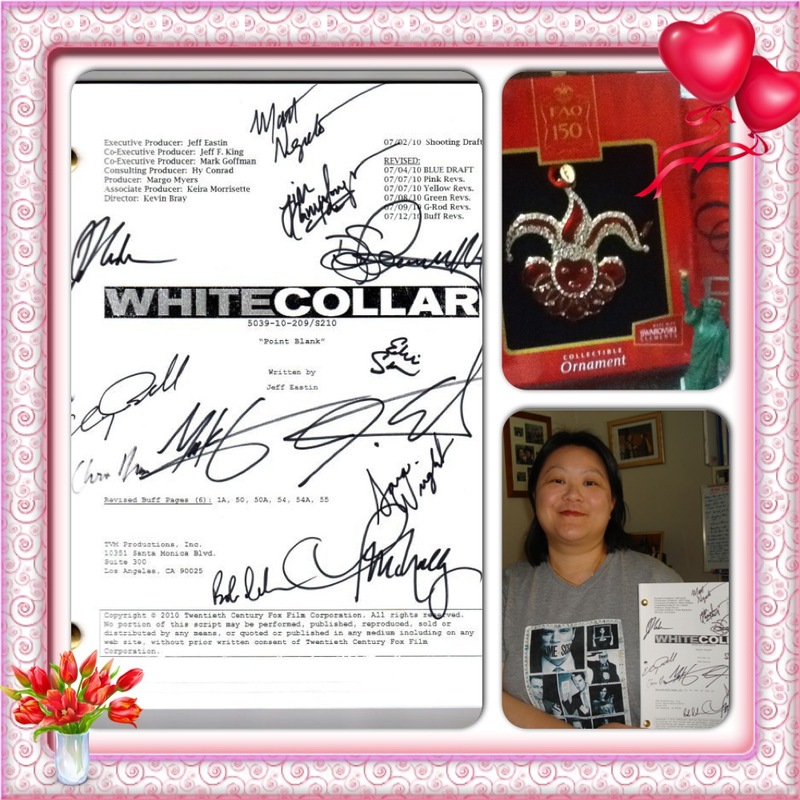 It was signed by the entire staff in the White Collar writers room!!! Believe me when I tell you that only three other people have been allowed to touch this script and as soon as I find a suitable frame, this little puppy is going to be behind glass so it will never fade or risk any potential spillage of any form of food or drink damaging it! And in case you were wondering, the other gifts in the parcel were souvenirs from The Big Apple – a very blingy limited edition decoration from toy store FAO Schwarz (which I really want to wear around my neck for its sparkliness) and a miniature Statue of Liberty. As if the script signed by all the writers wasn’t enough, a week later I received a message from Lena Lamoray, whose website I contribute to with my advance reviews of a number of USA Network shows, including White Collar, that the show’s creator, writer and executive producer, Jeff Eastin, is doing a press call ahead of the season 4 mid-season finale. Lena asked if I would like to take the interview since it would mean a 5.30am international conference call for me. “OMFG OF COURSE I WANT TO DO IT” was pretty much my reply. If you have somehow missed my wrap-up of that phone call, you can read about it here. The phone call with Jeff was only the start of the most amazing September day and it was a very long day (I had woken up at 4.30am to prepare for that call). After managing to get through the work day without falling asleep or being giddy over the amazing way it started, I then went to a performance by the Vienna Boys’ Choir with my Mum (another birthday present). We had second row seats that were as good as the front row because there were two empty seats right in front of us despite it being a sold-out concert (their loss was our gain!). We were thoroughly entertained by the angelic voices of the boys for almost two hours. After the concert, I went to the post office (again) to pick up not one, but two parcels! 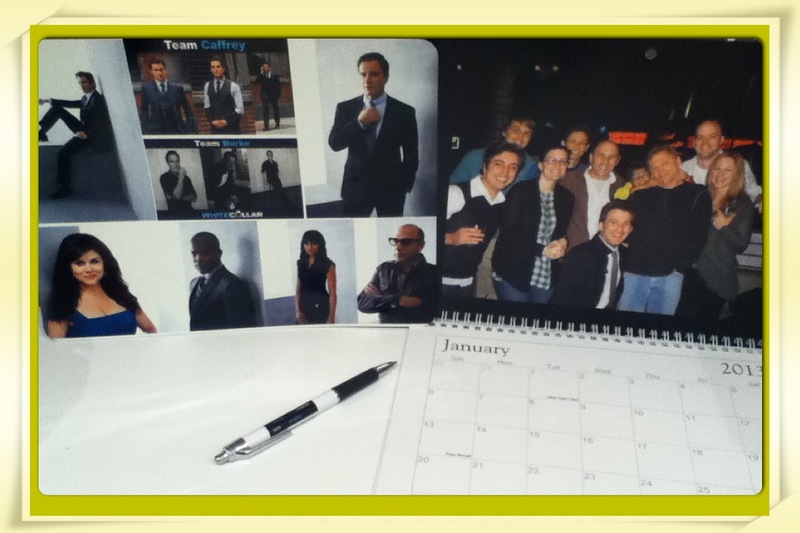 One was from my tweetpea, Claire from Perth, who continued the theme of my writers’ crush with a 2013 calendar featuring photos of the White Collar writers with some of the cast, a pen with all their Twitter handles, and a giant fridge magnet made from the collage she had got signed for me by some cast members and one of the writers of the show. So here comes the explanation about the severed limb which was graciously signed by the stars of White Collar, Tim DeKay (who had generously done video shoutouts to me on my last two birthdays) and Matt Bomer. As you can see, the limb came with a “tracking anklet”, complete with the green and red “lights”, as worn by Neal Caffrey! It quickly became a running joke that I wanted that severed foot for my birthday. And this is how I have learnt that when you set Ceil Kessler a challenge, be prepared to be awe-struck by the results! Not only was she responsible for convincing the writers to sign that script for me, but she somehow managed to finagle the New York production office of White Collar to get Tim and Matt to sign that severed leg for me! 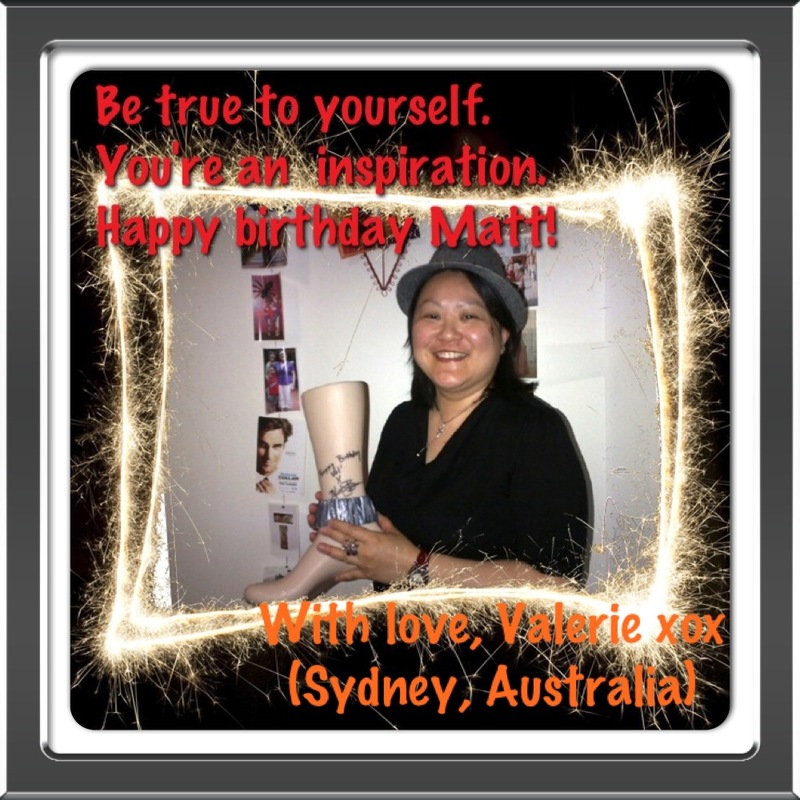 I would dearly love to know what their reactions were when they were handed this leg and asked to sign “Happy Birthday Val!” on it (seriously Tim, if you are reading this, I would love to know just how crazy you thought I was…and now you understand the story behind this leg so perhaps you will hold off on getting that restraining order? :)). I believe special thanks are owed to Joe Henderson and Chris Masi who were Ceil’s partners-in-crime in making my gifts a reality. Now, only a couple of days away from my actual birthday, and the awesomeness of my birthday month continues to grow. 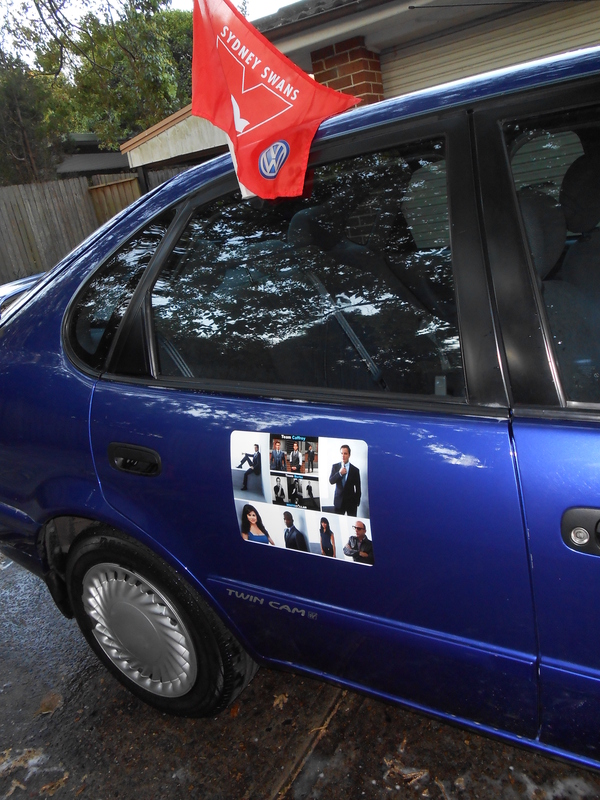 I am heading down to Melbourne for the weekend to be in amongst the craziness that is the AFL Grand Final (Australian equivalent of the American Superbowl) to be played out between my team, the Sydney Swans, and the Hawthorn Hawks. It is going to be an amazing day at the Melbourne Cricket Ground (it may have been built for cricket but is the mecca of Australian Rules Football). I would dearly love to see my homeboys win this coveted premiership title, which we last contested for in 2006 but won in 2005. Let’s bring it home, boys! So that’s all from me for now. I am still amazed by my birthday gifts – but more importantly, the knowledge that I have friends who would go to those lengths to make it happen. So whenever I feel a bit down and depressed, I just have to look at that limb sitting on my shelf in my living room, look over at my fridge door and hold the pen to remind myself that I am truly blessed. 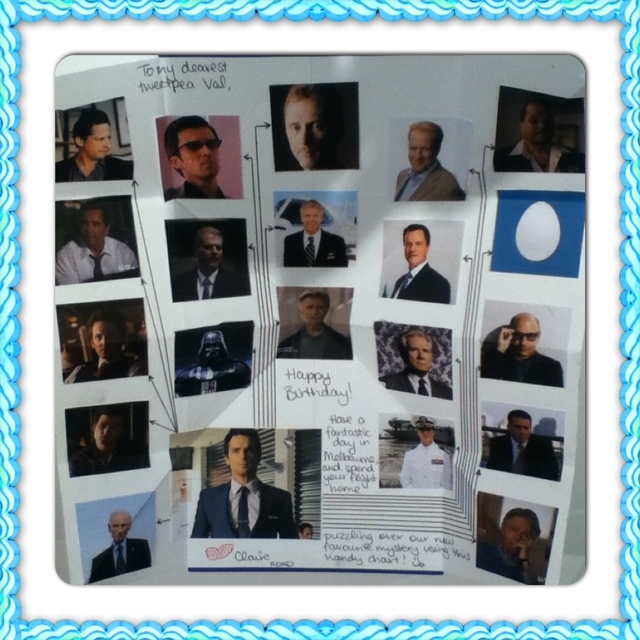 This entry was posted in Humour and tagged Alexandra McNally, Birthday, Bob DeRosa, Channing Powell, Chris Masi, Dan Shattuck, Eddie Serrano, Jeff Eastin, Jim Campolongo, Joe Henderson, Matt Bomer, Matt Negrete, Sara Wright, Tim DeKay, USA Network, White Collar, writers on September 28, 2012 by Valerie Leung. Love it! What awesome gifts! happy birthday to my crazy daughter. They say good things come to those who wait..well it sure does! Deservedly so too. 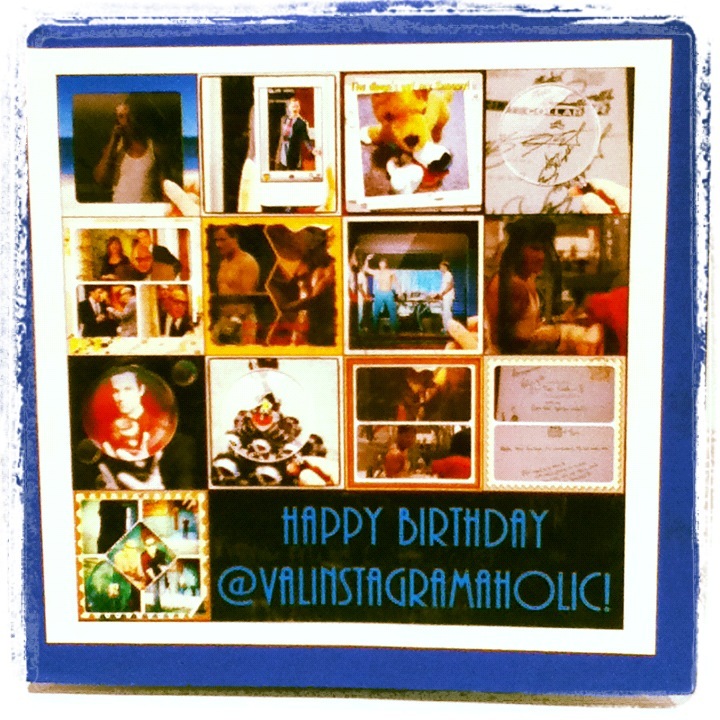 Happy birthday Val! HAHAHAHA omg I’m so glad you explained the leg, because I was seriously wondering when I saw it on your Facebook. And as awesome as the legs are, I don’t think anything in the world could top that script. What an amazing post. And you totally deserve it. I’m glad you had a wonderful birthday! Thanks Christine and you’re right the script is amazing because seriously how rare is it to have the entire group o writers and their assistants in the room at the same time to do this? And they were so awesome to have done it. 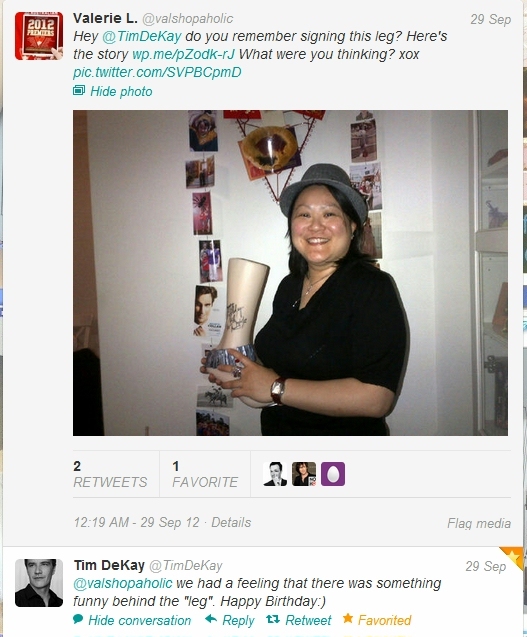 I still would have liked to have seen the look on Tim’s and Matt’s faces though when they were asked to sign the leg! Lol!